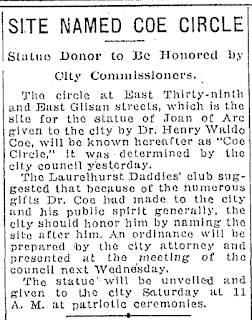 The circle at East 39th and East Glisan streets, which is the site for the statue of Joan of Arc given to the city by Dr. Henry Waldo Coe, will be known hereafter as "Coe Circle," it was determined by the city council yesterday. 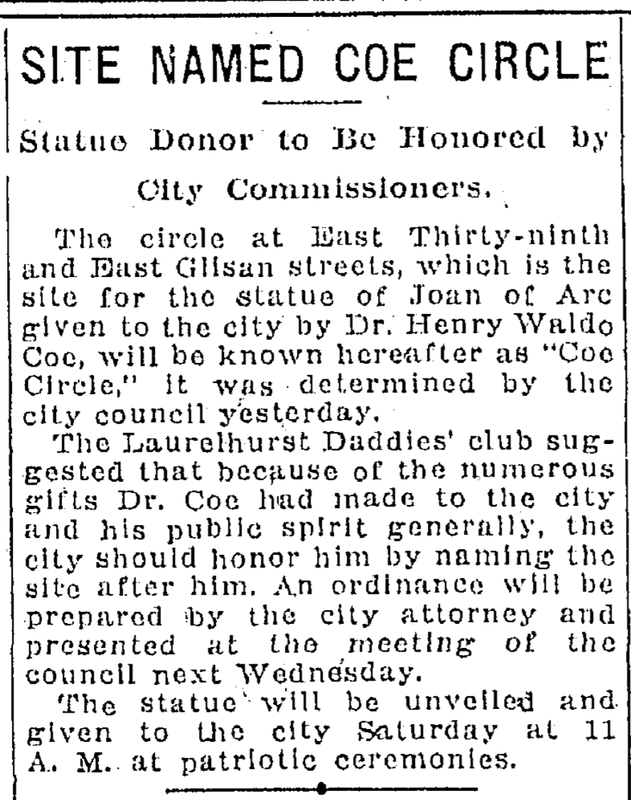 The Laurelhurst Daddies' club suggested that because of the numerous gifts Dr. Coe had made to the city and his public spirit generally, the city should honor him by naming the site after him. An ordinance will be prepared by the city attorney and presented at the meeting of the council next Wednesday. The statue will be unveiled and given to the city Saturday at 11 AM at patriotic ceremonies. About 30 trees will be removed from the circle at East 39th and East Glisan streets so the view of the statue of Joan of Arc to be given the city by Dr. Henry Waldo Coe will be obscured. Opposition to the removal of the trees appeared from the art commission, which that a suitable frame of trees should be left for the statue and all of the dead and undesirable trees removed. Dr. Coe, however, wanted the view of the statue clear from all angles and in this view Commissioner Pier agreed. The trees will be removed by the park bureau and some of them may be used elsewhere. Shrubs and flowers will be planted in the lot about the statue, which will be dedicated May 30 at patriotic exercises.